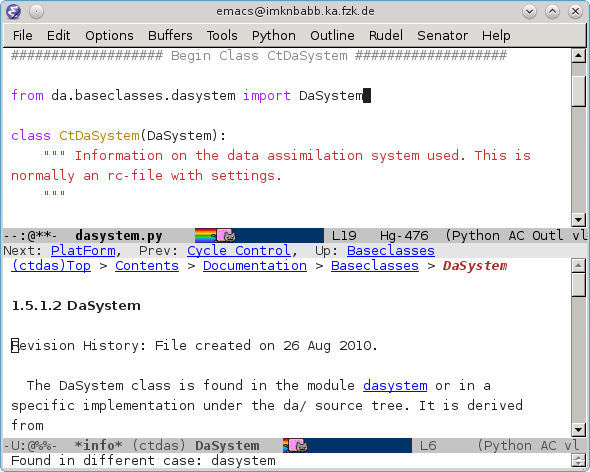 I just found the excellent pydoc-info mode for emacs from Jon Waltman. It allows me to hit C-h S in a python file and enter a module name to see the documentation right away. If the point is on a symbol (=module or class or function), I can just hit enter to see its docs. In its default configuration (see the Readme) it “only” reads the python documentation. This alone is really cool when writing new python code, but it s not enough, since I often use third party modules. And now comes the treat: If those modules use sphinx for documentation (≥1.1), I can integrate them just like the standard python documentation! The text in this image is from Wouter Peters. Used here as short citation which should be legal almost everywhere under citation rules. I want to save you the work of figuring out how to do that yourself, so here’s a short guide for integrating the documentation for your python program into emacs. The prerequisite for integrating your own documentation is to use sphinx for documenting your code. See their tutorial for info how to set it up. As soon as sphinx works for you, follow this guide to integrate your docs in your emacs. To build the info file for python yourself, have a look at the Readme. Now turn your own documentation into an info document and install it. # One entry per manual page. ('index', # startdocname, keep this! False), # better keep this, too, i think.